My SP8 Hostess has asked us to "Flash our knitting bag" so here it is. What's in the bag? Well there is still the Circular Mitred Square blanket as I have a few more ends to tuck in on that puppy. Also there is the navy and light blue knit person I am making for Bag me Along. The turquoise Irish Hiking Scarf - I love this yarn, I love this scarf but for some reason it is taking me forever to finish it. Even longer is the Here and There Cables scarf from the Scarf Style book. I really love this scarf and the yarn - serengeti - but have been working on it for a VERY long time. The colorful scarf at the top is my "Not Entirely Entrelac" scarf in Karaoke which I just started the 4th of July weekend and is knitting up fast. The blue/green is another baby blanket out or Lorna's Laces Worsted superwash and finally at the bottom is my Cozy out of Cherry Tree Hill silk/merino blend in Birch. I love the color on this one and the design but am having a really hard time whenever you have to k2 through the back. I bought some Addi Turbos (never tried them before) which I'm going to switch it to and see if that helps. Also the yarn is thin and it's impossible to memorize the pattern so progress is S L O W! Not pictured (because it's too big for the basket - is my prayer shawl/throw that I am making for Horsey Girl in Lion Brand Homespun Magenta. That's a mindless knit so I take it on car trips but it is getting to big even for that! 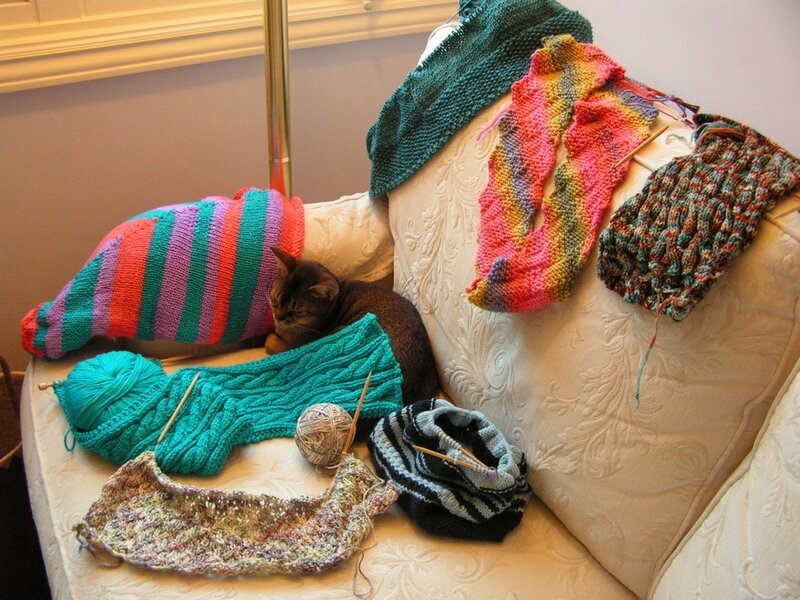 Now Yarn Yenta has asked us to tell you WHY these items are in the bag. I really don't know how to answer it - they are in there because I am working on them (or hoping to start working on them again) and I love to knit! Next - my good friend Bonnie (yeah Bonnie - you helped me figure out the hyperlink!) has asked us to FLASH OUR FREEZERS! So here is mine. 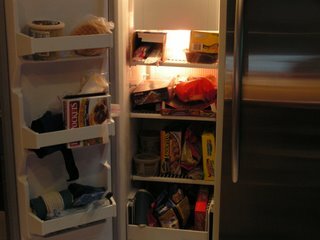 It is clear looking at this that we live only on frozen junk food and there is no real food in here. From reading what's in Bonnie's freezer vs. what is in mine it is clear she is a good mother who cooks real food for her family and I am a slacker who orders way too much take out! Oldest item - frozen chicken breasts in a ziplock - wonder how old those are! Best surprise - I have LOTs of margerine - don't have to buy that for awhile. Worst surprise - there is nothin but junk in there! OK - now it's your turn - flash your basket or your freezer and let me know! Actually, Allison, the reason there is so much good food stockpiled in my freezer is because I have NOT been a good mom lately. LOL! Not much cooking going on in my house for the last 6 months due to my travel schedule! My husband's favorite menu plan: "Hey kids, who wants to go to BW3s?" Your freezer really doesn't look that bad!